Marriage Counselor: Taking a listing involving a divorced couple requires delicate handling. There are always 3 sides to a story…his, hers and the truth. No matter how hard it is to stay neutral with each member of the couple, keep reminding yourself…whatever it takes to get this deal through, I will do. Gardner: For those of you who have vacant home listings, this is the time of year to take charge of the upkeep of the yard. First, contact the sellers and get their permission for you to hire a lawn service to take care of the yard for the season. Remember the Golden Rule: Curb Appeal. First impressions are lasting impressions. If a home isn’t taken care of on the outside, buyers are wary that the inside wasn’t taken care of either. Remember to get a signed contract between the lawn service and the sellers or you’ll be the one responsible for payment. Merry Maid: Have you ever scheduled to hold an Open House and walk into the home and think, What Were They Thinking?!! There’s dirty dishes in the sink, clothes on the floor and clutter everywhere (which the owners promised to clean up!) Plan to arrive an hour earlier to avoid any problems that can be taken care of ahead of time. It’s funny when a bunch of Realtors stand around a cocktail table and share some of their horror stories, funny stories and some of their just down-right unbelievable stories. One thing comes to mind. Being in the real estate industry, one has the ability to create unlimited income and great experiences. It all depends on you being willing to do…Whatever It Takes!! Bathroom decor doesn’t have to be synonymous with boring! The key to fancying up some tired decor in your bathroom is to first take stock of what you have, then go from there. This is especially true for small bathrooms, since you have about one-third of the space of any other room in your home. Adding furniture is not really an option and small trinkets can easily make the space look cluttered. 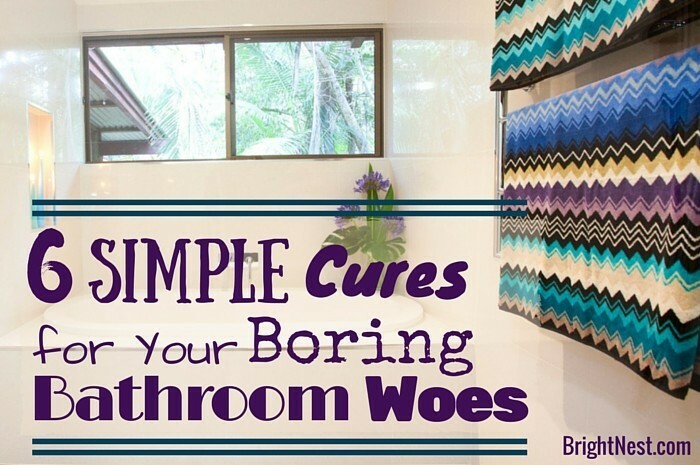 Here are six simple cures for drab bathroom decor. If you have a small bathroom, get funky towel hooks – you won’t ever need to fold your bath towels again (win!) and they’re pretty easy to install. With a power drill and screws you can add some towel hooks in about 5 minutes. Have a bit more space? Try hanging your towels on an old ladder. You’ll still have to fold them, but at least it will look super stylish! As soon as you make this subtle change, you’ll start feeling better about this space. First, take a peek at any cabinets or drawers you have. Those doorknobs or handles can be replaced! 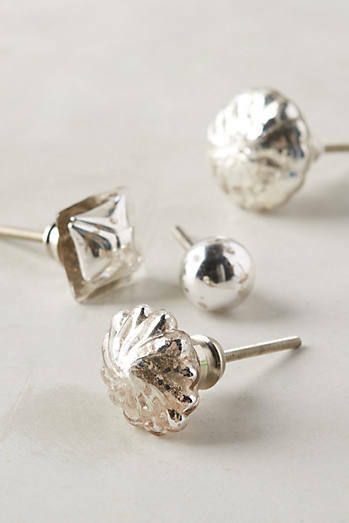 Anthropologie has a fun collection of cabinet knobs for just about every style. After that, take a look at the doorknob and radiator vents. These little details, once replaced, can make a big difference on the atmosphere of your bathroom. Once you’ve got the hardware you need this might take you fifteen minutes tops! If you have a standalone bathtub, take advantage of that space! Add an over-the-tub rack to class up your bathroom and add storage at the same time. This is a no-brainer. 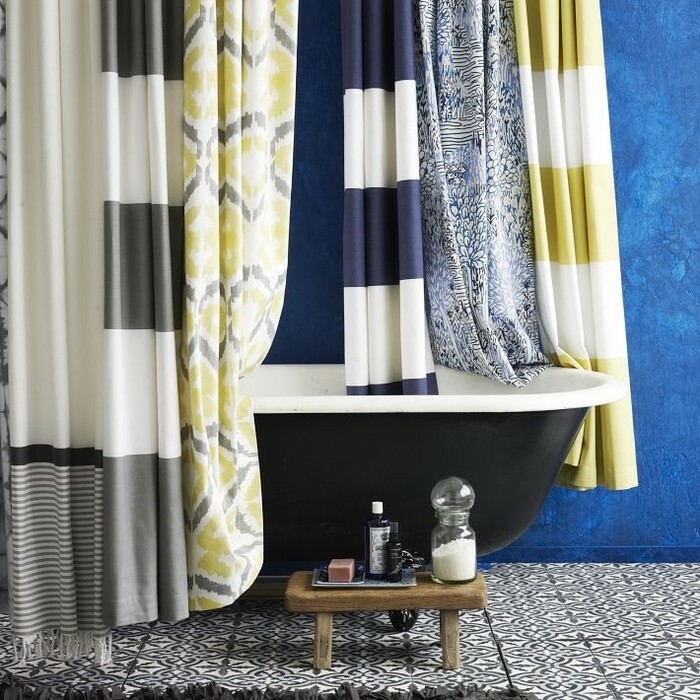 If you want to refresh your space, start with one of the biggest canvases in the room: your shower curtain. Plus, there are tons of options. We like Joss & Main for more classic feel, and if you want to go a bit more funky, check out Fab.com. Pro Tip: If you’re working with a cramped space, choose something with vertical stripes. This can make the ceiling appear taller, give the illusion of more space. Add a pop of color by painting your curtain rod! We recommend using mildew-resistant paint because of steamy-shower moisture. A fresh coat will also make your shower curtain hooks and curtain really stand out. Test the paint on a small area before fully painting the curtain rod. Add some greenery to your bathroom by hanging some plants from the ceiling. We recommend eucalyptus – humidity from the steamy water will cause the plant to release essential oils. Hello, stress-free shower! Pick up a plant hanger and install hanging hooks near your bathroom window. The Relocation Engineer published this in depth report and it is a must read for Franklin TN home owners considering to sell. Don't miss out on reading and discovering what many agents don't want you to know. ACT NOW TO GET THIS REPORT DELIVERED TO YOU AND GAIN INSIGHT INTO SELLING YOUR FRANKLIN HOME. Get this report and find out how to interview and select a qualified real estate agetn to effectively market your home for sale. EXIT Gold Realty welcomes Debi-Jo Henne to their list of outstanding Real Estate Agents. "We’re excited to welcome Debi-Jo to EXIT Realty," says Debbie Houck, Broker/Owner of EXIT Gold Realty. "EXIT is growing and attracting quality business people like Debi-Jo each and every day." Debi-Jo is an ambitious, goal oriented professional. She is always willing to go the extra mile to satisfy her clients and customers’ needs. Her goal is…”To make your realty a reality”. She is an organized, multi-tasking, go-getter. Debi's area of expertise is Grasonville, Kent Island in Queen Anne's County, and in Anne Arundel County, Pasadena and Glen Burnie Homes, as well as the surrounding areas. Debi began her sales career with BMW, where she worked in the service department of Mini Cooper and then branched to BMW and began selling vehicles. She later received an offer to work for the government in telecommunications security department, but decided to get back into sales, during the government sequester. Real Estate was the obvious choice to her. “People love cars, but they will always need a place to live.” says Henne. Debi-Jo currently resides in Grasonville, MD with her fiancé and their daughter. She enjoys painting, decorating and landscaping homes and businesses. She and her fiancé also own a landscape company, Shore Line Landscaping in Grasonville. You can reach Debi on her cell phone at 443-944-4944, or via email at . Her office base is at 115 Pullmans Crossing Road, Ste 104, Grasonville, MD 21638. 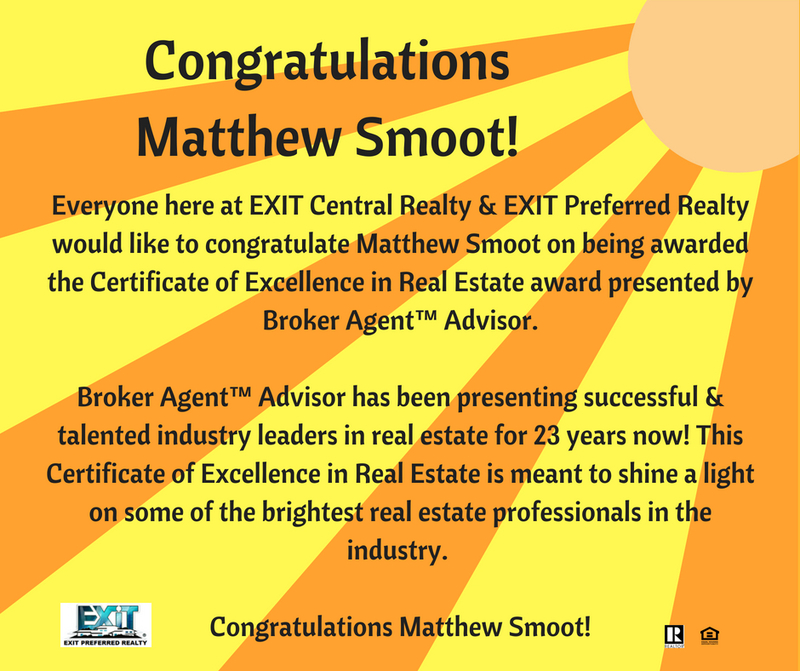 EXIT Gold Realty is located at 115 Pullmans Crossing Rd, Ste 104, Grasonville, MD 21638. For more information, please call 410-643-4111.